Renewing Night Conditioner provides powerful oil-free night care for all skin conditions. This unique blend of rhythmitised ingredients supports the skin’s natural processes of night-time renewal; dry skin is encouraged to retain oil and moisture; sensitive skin is soothed; oily, blemished skin is calmed and balanced. All skin conditions, including mature skin, are refined and revitalized. Formulation: Rhythmitised dilutions of witch hazel, madonna lily and silver along with precious rose, bryophyllum (kalanchoe), marsh mallow and sunflower support the skin’s essential night-time tasks of cleansing, balancing and renewal. What a difference in my skin. I have sensitive skin and struggle with redness. I noticed a big difference right away, I have only been using it a week but what a difference. My skin looks rested and calm and very soft and hydrated. Its like my skin said ahhhhh thank you! Just what I needed. Will definitely purchase again. I bought the ampules on a referral but didn’t think I would notice any difference honestly. After using half the ampules, I could see noticeably fewer lines, wrinkles and smoother face and neck complexion. I will definitely reorder! Although this night conditioner is expensive, I definitely think it keeps my skin young looking. I use it 4 times a year.. spring equinox, summer solstice, autumn equinox and winter solstice (easy to remember)! A must for transitioning from other products to Dr. Hauschka’s line. The first week is difficult and then your skin begins to look and feel healthier and cleaner. I found myself battling with less breakouts and challenges with oily/dry patches. It allowed me to easily transition to a natural and safe skin care regimen with positive results. I am not happy with the results compared to using Night Serum. I had a break out on my chin which is very unusual. It is extremely expensive and I wish you had some type of refund policy. I won't finish my box. Sorry to hear you are not 100% satisfied with your purchase. Please give us a call at 800-247-9907 9am-noon and 1pm-4:30pm Eastern Standard Time, Monday through Friday to discuss returning your product. Thank you. I used this while transitioning from a heavy nightly moisturizer to just a nightly serum. My skin definitely is less dry and the texture has improved after 30 days. i use this once a month, and it feels like a mini spa day to me. love that. it leaves me feeling crisp and refreshed. My skin had gone a little haywire. We are experiencing winter in Massachusetts, then had a warm spell and then back to very dry and cold. My skin got so dry on my cheeks and congested everywhere else. I just finished using the ampules for 30 days and have completely re-balanced. It takes getting used to no moisture at night but after a 1/2 hour your skin will feel soothed. I tried this for a few days and it made my face breakout something horrible. I can’t use. I have been using Renewing Night Conditioner for about 3 weeks now. After your nightly cleansing, you apply this conditioner which works overnight. It is so convenient to use since it comes pre-measured in a liquid form that is easy to apply. It makes all skin conditions--oily, sensitive, etc.--renewed and revitalized. It has been awhile since I did a round of this treatment that you use over a 28 day period -- but when I did, it worked really well to stabilize my skin during a period of stress and was noticeable to myself and others (got a lot of compliments...). I think I would benefit from using it per the suggestions, a few times a year, and I would definately recommend its use. It is a very unique treatment that really seems to work with the body's & skin's cycles. I have used this for two rounds so far, three months apart, as recommended on box. Skin definitely softer. As in people are commenting on how nice my skin looks. It does not address age spots. I suggest Haushka make something for that. I would buy it. LOVE the renewing night conditioner. Amazing product. Definitely will use as recommended. This is my second round. At the beginning I thought I was applying just water. I was wrong. After 1st round, no new comedones, smaller pores, balanced skin... just nice skin. After 2nd round the same, but this time I’ve noticed that dark spots are lighter. And other people have noticed too. I’ve been asked if I’ve had surgery. Love it. I love this product! After a few days of using it, I can see a visible transformation in my skin, softer, calmer, and clearer. I swear I look several years younger after a round of the renewing night conditioner. I also appreciate that I don't have to use it daily, but can run through a cycle a couple of times a year for fantastic results. First time using this product and I'm going on day 15 of 28 and love it so far! I didn't notice any difference after two weeks of using this product. The product had a water-like consistency and was burdensome to apply. I would not recommend or purchase again. My husband and I would highly recommend this product. At first use we appreciated how the conditioner immediately absorbed into our skin and that overnight we could visibly see a lift to our faces. Our skin feels velvety smooth. We love this product. This product didn't mention Lactose in its ingredients in 2012. Did the composition change since there ? And can intolerant people use this product (and others of your range) even if it contains LACTOSE? Thank you very much. I was recommended to use this product to reduce redness in my acne, but unfortunately I haven't noticed much of a difference. I love Dr Hauschka products overall because of how they keep moisture while cleansing, but maybe my acne condition is too much for the night conditioner to handle. this product is amazing, my skin looks brighter, my pores shrink, no more congested skin, very happy with what i see!! This conditioner works so incredibly well that I have nicknamed it "liquid gold". Skins feels and looks smoother, less wrinkles and rejuvenated. Please Note: use as directed. One of my favorite products. It's light on my skin and does not make it oily. I also seems to even out my skin tone. I used to apply heavy night cream every nights because my skin is dry and i felt like i always needed very emolient cream to hydrate my skin. Despit applying day and night cream, my skin still be the same, that is dry and somehow i felt like whatever i applied to my face it just stay there at the surface level even though i exfoliate my skin at least once every two weeks. 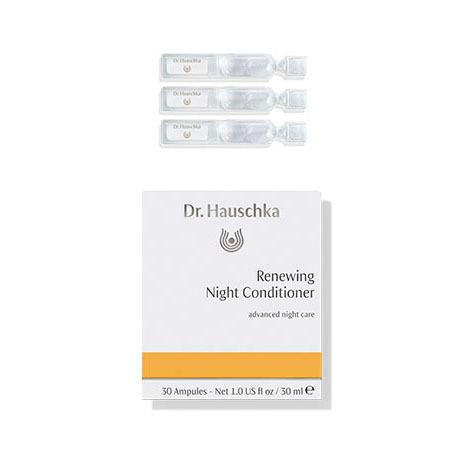 I read about Dr. hauschka's regimen of oil-free night care and i wanted to try, so i ordered this Renewing Night Conditioner to prep my skin for oil-free night care approach. After i used this product less than a week my skin (which i always believed that it's dry) has become less dry during the day time, so it has shown that it has transformed. I felt very good with my skin now as it also become smoother and looks hydrated. I decided to try on other product of Dr.Hauschka, those are facial toner and revitalizing day cream, lets see how it works. One thing that i want Dr.Hauschka team know is that it would be much better if the toner has cap so that it wont leak when traveling, also the glass bottle should be light proof, so i dont have to kept thinking that the ingredients will be harm by the light even though if the ingredients are not light sensitive but again the customers will be more happy with the light proof bottle. I had some of the conditioner left over and put it on my arms. The next day both arms were covered in a rash. Needless to same I'm not going to use these products anymore. I used this Renewing Night Conditioner for 15 days and I still countinuing to use it. It is a very nice conditioner with every single small package, very clean and nice. Good for night, make you feel comfortable and no oil but moisture. My skin type is dry, use this made me feel very nice. I like to go to bed with my skin clean, feeling the pores open and open next day with the skin smooth and fresh. I tried some products before this. Now don't need to look any further. I am very satisfied with the results. Subtle and efective. I can't keep my skin clear without it! If you have congested or acne prone skin, buy this product!! It clears things up & shrinks pores immediately. I saw a difference after the very first night I used it. It is so gentle it makes your skin feel great......I just love it! This product works, and works immediately. I love it. Skin cells are renewed every 28 days. Mirroring this same regenerative rhythm, Renewing Night Conditioner should be used for 28 days in place of a toner. Apply nightly after evening cleansing. Twist off tab at top of 1-2 ampules and empty contents into cupped hand. Press gently and evenly to skin until all Conditioner is absorbed – include eyes, lips, earlobes, neck and décolleté. We recommend one 28-day cycle of Renewing Night Conditioner per year for each decade of life (for example, 3 times a year at the age of 30). Also appropriate for guiding the skin through times of change, stress or transition. Warning: Use entire contents and discard ampule. Do not save open ampules for later use. Skin that is accustomed to heavy night creams may feel tight or dry during the transition to Dr. Hauschka's oil-free night routine. Applying Revitalizing Mask in the late afternoon or early evening can help ease this temporary condition.